Price includes frame, graphics, case and XL mount. Screen not included. The strongest and most versatile pop up system on the market, with unique features that set you apart from the crowd. A unique modular design allows you freedom to create custom looks and sizes with the ability to expand both vertically and horizontally. Create the perfect exhibit by adding accessories, including backlit panels, custom cutouts, monitor mounts, shelves, and lighting. Fabric or graphic panels attach easily with magnetic strips to give a seamless professional look in no time. Our complete kits include LED lights, deluxe hard case with wheels, and fabric or graphic case to counter kits. Lifetime frame warranty. 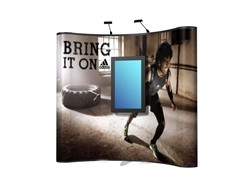 50.00" x 15.00" x 9.00"
Showcase your brand with dynamic video content! This super-strong popup display can hold screens up to 42" with ease. The TV is hung like a picture frame, so you can even hang at an angle. Decide your preferred location at any height you want to go with your custom graphic design. The stabilizing feet makes it super reliable even in high traffic areas. Make your next event a success with Energy Popup kits.